In this age, iconic police weapons overtake the people and media relentlessly. Brad Downey, now more than ever before, wishes to requite the power of the people. In this limited edition, the rubber sculpture symbolically takes the power away from the weapon, and those behind it. With humorous undertones, the police baton transforms into a flaccid version of itself. 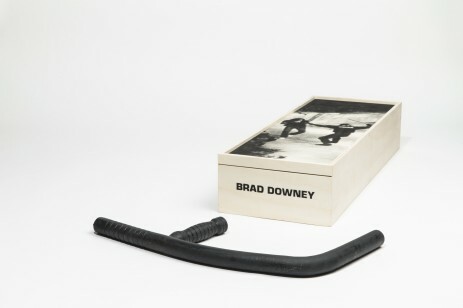 Packaged in a hand silkscreened wooden box, this multiple, by Brad Downey, is ready for presentation. This rubber sculpture measures 55cm. tall in an edition of 27. It comes in a screen printed wood box with a certificate of authenticity signed and numbered by the artist.